Down to Hook today; a circuit of 20, about 7 miles which took me three hours, including a rather fun climb up a cutting toward a motorway (but stopping at the fence) to get a micro. Then onto the bike for a tour of Hook, and finally a bunch of drive-bys and cache-and-dashes for a total of 41 finds, no DNFs. My hip didn't like it much, though, and my thighs are telling me "Rest day tomorrow". A drive crash on Cully, and it's the system drive, so I had to reload the system on a new drive. I tried to load Fedora 16, the latest, but that wouldn't go, neither would Fedora 15, for some reason the Gigabyte motherboard I'm using can't handle those. But Fedora 13 went on fine. First, lunch. We cruised round Reading for a while looking at some of the awful eateries that were there, then went to University of Reading for lunch. And then on to find the caches. The first one, we didn't find. We spent about an hour there. But about 60 people have already DNFed it, and no-one has found it. The second one was also a DNF. Out of ten attempts only one cacher has found it. The third one was nearly a DNF, it was only by persisence and a PAF that we finally spotted the blighter. After that, several caches that were a lot easier. A trip to Shoreham today. A nice day, and the route is 8.5 miles, all bridleways and other cyclable tracks, but for reasons IO can't explain, I decided to go on foot. What a stupid idea! Oh well. Going round took me five hours; on the bike it might have been a bit less, plus I wouldn't be so tired afterwards. En route, i did the dreaded Shoreham Bridge cache; SimplyPaul and I DNFed it before, and this time I was going to give it half an hour, no more. But after ten minutes, I spotted something out of place. So I called the Sussex Police, and they sent out the bomb disposal squad and a dog unit, plus Trumpton in case it set the wooden bridge on fire, and a couple of ambos for luck. 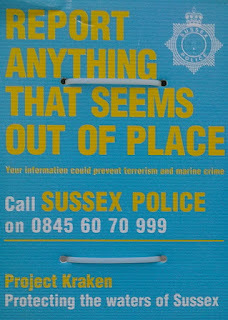 Terrorism has been successfully prevented, and marine crime thwarted. A very clever hide. Well done. I finished the circuit, then went down to Shoreham to finish a multi that I'd started a few months ago; a very good day out, 57 caches found, no DNFs. I saw the doctor today about the continuing pain in my right thigh. When I arrived, I was given a form to fill in about quality of service. I said that everything was great, except that I had to wait about two weeks till the appointment. Two weeks wasn't a big problem in this case, the leg has been bothering me for several months. But for most ailments, two weeks would be a very long time. So, about my leg. We wiggled it and waggled it, and I told him when it hurt (it mostly doesn't). He thinks I might have an inflamed something (I forget what he called it), and he's referring me to a physiotherapist. And tomorrow I'm planning a 10 mile hike near Shoreham, so it can't be that bad. Cheltenham went well. I got to the colocation at 11:30, swapped the drives from one server into another, installed that, installed five others, and took out the dead six servers. Then I wanted to log in to test the new servers, so I set up a workstation and tried to connect to them. I worked out how to change the workstation from a static IP address to use their DHCP - I was quite pleased that I was able to do that. But after a few seconds, I realised that my firewall was stopping me from connecting, which is exactly what it's supposed to do. So I put a keyboard and monitor on one of the new servers and checked them all out that way - they were all working. When I got home, I made all the name changes that were needed, and I'm reloading the data that they're missing. But one server wouldn't start up - isn't that always the way? Well, it's not critical, it's the "fourth copy" of that particular thing - I've got three working servers with the same stuff, so that will have to do. Annoying, though. I'd finished at 1:30, so I went to the hamburger stall across the road, and very good it was too. Then I left the car at the colo, and got on my bike, and biked round Cheltenham doing 20 caches. I got back just before dark and did a couple more on the way home. Ladysolly has been very worried that she might have given chickenpox to grandson.1; it was a couple of weeks after she had shingles (which is caused by the chickenpox virus) so we thought she wasn't infectious, but can one ever be certain? However, it turned out that grandson.1 didn't have chickenpox, he had a skin rash. So ladysolly can sleep again. Out to Crocklehill, Kent today. To get there I went clockwise round the M25 and over the QE2 bridge, always a pleasure, but to get home Madge sent me clockwise round the M25 again. So I circumnavigated London today. 70 caches, 1 DNF. Seven hours solid walking, probably about 14 miles, and my thighs are feeling the pain, I'm walking like a penguin. Still, I don't have much to do tomorrow; chauffeur duty for ladysolly, but I won't have to get out of the car, and then some programming. 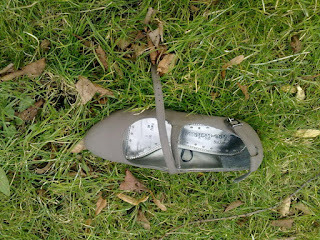 Because while I was out walking, I solved a tricky little programming problem that's been bothering me for ages. I often have good ideas while I'm out - between caches, there's not much to think about, and no distractions, so I can really ponder. The problem I had, was in doing backups using ssh, if a filename had ugly characters in it (like quotes, spaces, ampersands, dollar signs) then I just was not able to work out the very complicated quoting system I needed to use to pass the filename unscathed to the shell for processing. My new solution - for files with ugly characters, don't use ssh or the shell, do it with ftp, which is slower, but since it'll only be for a tiny minority of files, that won't matter. I can't wait to get coding on this tomorrow. And quoting will be very very simple - I probably just sling a couple of " round the filename. While I was out, I was approached by as lady in a car. "Have you seen any dogs running around?" Now you might think that's an easy question, to be answerewd either "yes" or "no", but I found it a bit of a puzzler. I had seen a dog running around, but that was two hours and four miles ago, so she probably wouldn't want to know about that one. So - I had to work out what radius of space and time she was implicitly asking about, apply that, and come up with an answer. No, I haven't. So she drove off, probably wondering why it had taken me so long to answer. And I found a coal post, always good to see. But this one didn't have a cache nearby! I expect it will soon. I haven't been out caching with ladysolly for a long time, so I chose something a bit special for today - a tour of Pangbourne. GC37FQZ "Do your Homework". I did my homework, found the reference point and the car parking place, and used Ordnance Survey coordinates to work out where the dozen locations are - the fifth digit of an OS map reference represents one meter of distance. So we trekked around the town, and four hours later we had all the numbers. I worked out where the final was, and didn't like the answer. So I changed the colour of the elephant, and that was just as bad. So we went back to the car, and while ladysolly got the coffee ready, I did a bit more research. It turned out, I'd forgotten that I had to use a different reference for the offset to the final - I'd done the homework some weeks ago. 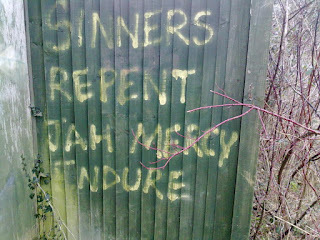 So I did that, and we went there, and it was no use; about 50 meters into private land across a fence. So I changed the colour of the elephant again, and that gave me a plot bang on the footpath we were already on. We eagerly trundled along to there, and made an immediate find! Hurrah. Today, we visited daughter.1 and grandson.1; ladysolly had a great time rolling on the floor with little Chops. Meanwhile, I finished reading a book about Dunkirk, and read the whole of the latest book by Bernard Cornwell. And that's all I had with me. Fortunately, I'd also brought my Kindle, so I had lots more to read with me; all freebies mostly from Gutenburg.org. And ladysolly got the time of the train back wrong, so we had to wait an hour at Marylebone. Hurrah for the Kindle! Geocaching in Bisley today; 52 caches done, including 6 puzzle caches. I was on the bike nearly the whole day, so I'm a lot less tired than if I'd been walking. One really big lift over a seven-barred gate, that I nearly couldn't do, and some very mushy ground in places, but mostly good going over bridleways and roads. As I was passing the shooting range, there were some very loud bangs going on. Do they ever get stray bullets going outside the boundary? I would guess not, but I was glad to get away from there. I did one long circuit of 27 caches, that used 1 1/2 batteries, and then another shorter circuit of eight, using another half battery. On these long routes, I have the battery on the bike, and two more in my saddlebags; it's not really much more effort than to carry one spare. Plus I can carry the bike lock, pump, spare inner tube and a selection of tools - just in case. Cache of the day was at a ford; I parked nearby and put my wellies on, and then it was easy, but fun. 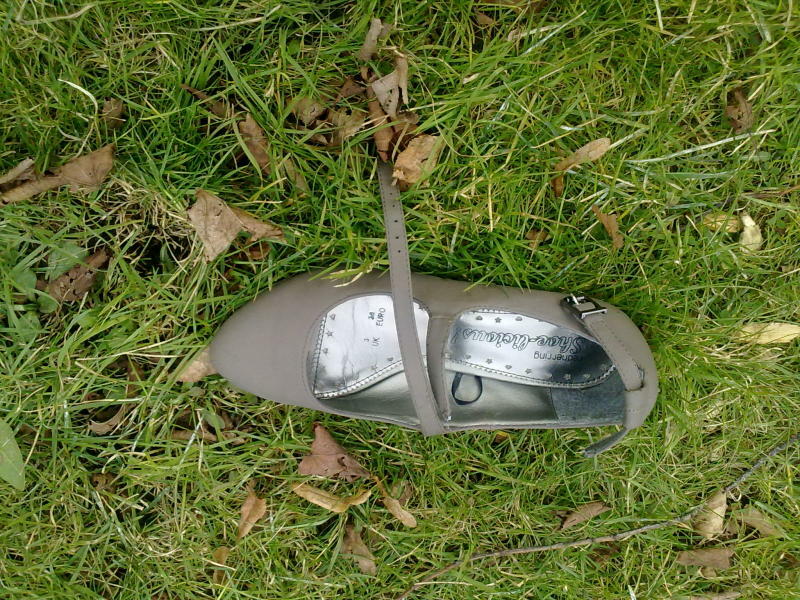 Imagine the sad story behind this lone shoe, and wonder how the ex-wearer got home. But then something more cheerful. 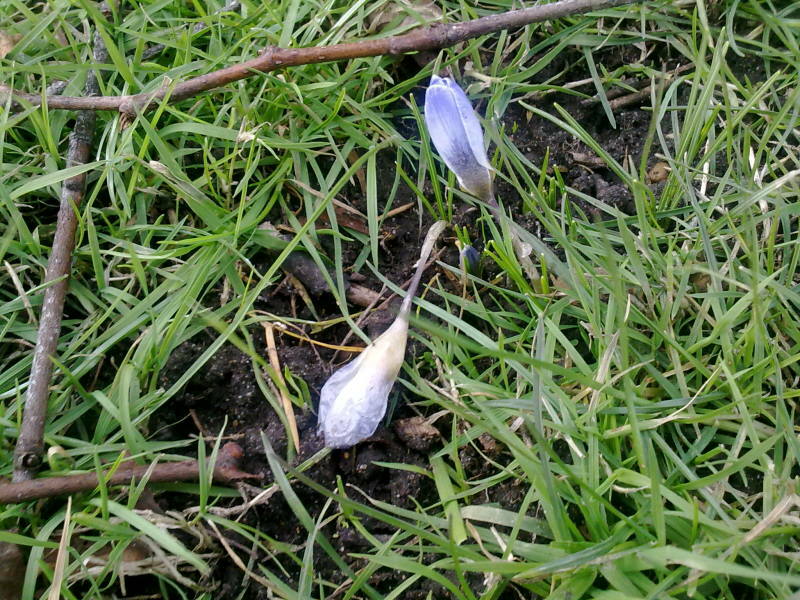 This is the first crocus I've seen this year. 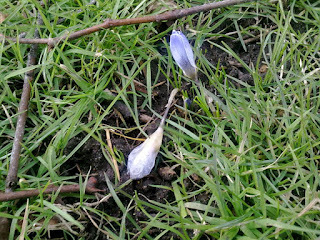 Admittedly it's a bit scrawny, but a crocus nonetheless. And then something just mystifying. What does it mean? 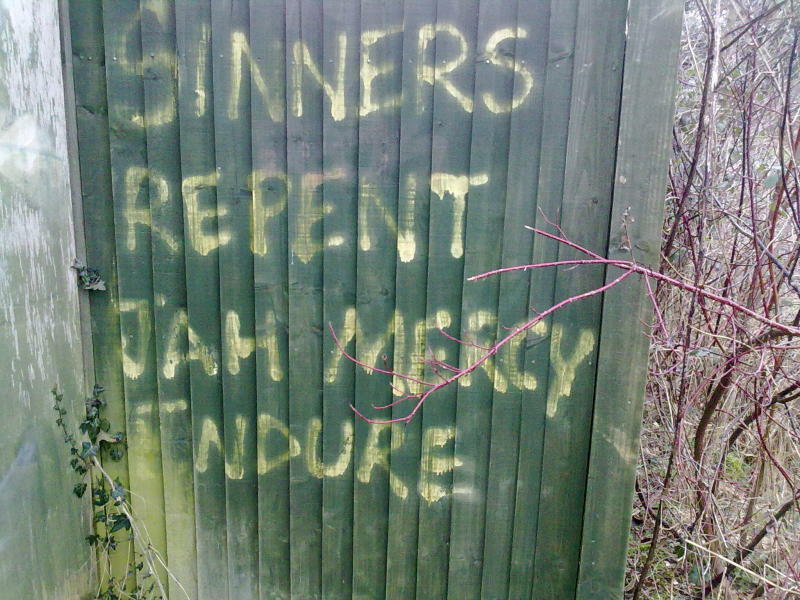 Does it really say "JAM"? Well, I found the cache a couple of yards away from it. Then on to the Cunning Cacher's event, so called because it's held in the Swan. It used to be held in the "Cunning Man", but they didn't like getting so many well-behaved and high spending customers, so we were asked to move. Since it was the 5th anniversary of this event, it was a special and large one, and many of us had more beer than we were accustomed to. Well, I did, anyway, but since SimplyPaul was driving, I felt I could get a bit buzzed. 32 caches found today, and a really good day out. I called Paul Drake of Vehicle Contracts three times today, to tell him about three separate emails he'd sent me. He's dealing with it. He's a nice guy, I think he's been ripped off by one of the email list vendors. He asked me whereabouts I was located, I told him near London and he sounded quite surprised - maybe he thought he'd bought access to a list of businesses in his area, which is up North? And not a generic list of email addresses scraped from the whois database. It's people like him that I feel most sorry for; small businesses are being charged for a spamming service that isn't ging to bring them any business. Because it's sent to email addresses that either no longer exist, or are irrelevant to the product being offered, or are filtered out by spam filters, or are deleted unread by the recipient. I also called Vehicle Leasing, and Glynn there said he'd get me taken off their email lists. He also gave me the name "Data Lists Global" which has cropped up before, and which I didn't follow up because their phone number wasn't obvious. So I tracked down Data Lists Global, I think; they seem to be involved in a few spam campaigns. 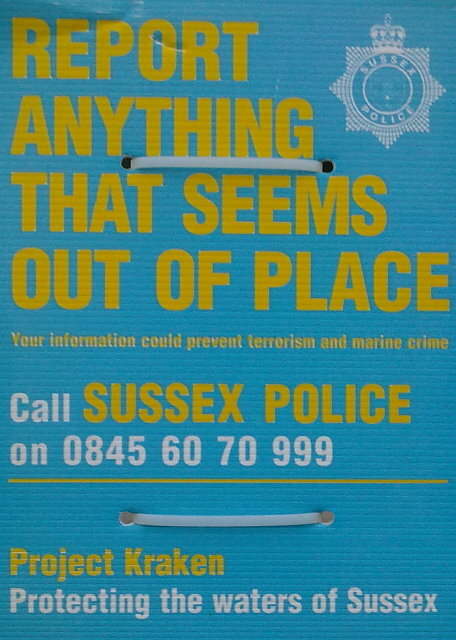 A whois gave me an address, Gemini Business Centre, 136-140, Old Shoreham Road. One of the firms there is debtmanagementguide.co.uk which is owned by SCB Media Limited, and Paul Careless is a director of SCB. A number there is 01273 224004, and we'll see what results I can get there - maybe they have nothing to do with Data Lists Global, but since they're at the same office area, maybe they can help me with a phone number. Paul seems to be the CEO of a number of enterprises at the same offices in 136-140 Shoreham road, and offering various financial services and other things. And some of them don't make it easy to find out their phone number (but by no means impossible, if you google around a bit). I also gave Kelloggs a follow-up call, and at last, they came up with something I can follow up. Sharon there told me that the campaign I was complaining about, was done by "Carat", but she wasn't allowed to give out any more information. So I googled for "carat email data" and found www.carat.co.uk, and on their web site they do indeed boast that Kellogs is one of their clients. So I phoned them up, and got the switchboard. I asked for "complaints department"; nothing. "Customer service"; nothing. Then the switchboard lady said she could only put me through to someone by name, so a quick bit of googling revealed that their CEO is Tracy de Groose, so I asked for her. That got me to her PA, who took details, and promised a call back. Which hasn't happened yet, maybe tomorrow? I haven't heard back from Nancy A. Christenson, nac@buckley-law.com, about "Lunch On A Lawyer", so I've emailed her a reminder. I mean, she offered me lunch, and I've expressed an interest, we just need to fix up when and where. And she replied, saying that the lunch is at their offices, so I've asked her where their offices are. She replied back Lake Oswego, OR. So I've asked her if OR means Oregon, USA. She said that it is. So I told her "Oh. I'm in England. Do you have an office in England? That's a long way for me to go for a lunch!" And she said that she's sorry that it isn't going to work out. The snow seems to have gone at last, so I'm planning to go out caching tomorrow, in Reading. Good news for the spammers! Well, not the whole of Cheltenham, just the bit where my servers are hosted. About 5 minutes after I lost contact, I phoned them up - they knew about it and were on the case. Some problem with a fibre. It was fixed by the time I woke up this morning. We reached 2000 pageviews of this blog! ... later ... They told me what went wrong. They had two separate connections to Telehouse in London, which should mean that if one breaks, the other is still running. Unfortunately, they both went through the same conduit, and when the guys at that end did some maintenance/updating, that took both of them out. There's a lesson there somewhere. They're looking to add a third connection now. I used to do a lot of this, 25 years ago, and I still do an occasional one. I decided to go through my old floppy disks, vintage about 25 years ago, with all the various articles and correspondence. I did this a while back, and pulled off a bunch of stories, which you can find on my web site. But I was going to get everything this time. They're all on 5 1/4 inch 360 kb floppy disks. These days, most computers don't even have a 3 1/2 inch floppy drive, and 5 1/4 drives are dead as a dodo. That's why I need to get this sorted out, whike it's still possible. But ... I still have one, I remember hanging on to it. So I went into the top room, and found it fairly quickly. I didn't fancy setting up a Windows computer, and if I just booted off Dos, what would I copy the data to? So I put it into a Linux box, which I had linked to my network. It was pretty easy to install, and I knew that I couldn't just put in the floppies and read them (like you can with Dos), I had to mount them. So I did that. I found about 20 diskettes, labelled 1 to 19 and 28 to 32. I wonder where the others are? So I started copying. After about a dozen, I started finding that the diskettes wouldn't read. And neither would the backup diskettes (in the same boxes). And I thought, huh, 25 years is a long time, they've deteriorated. And then I had dinner, and did some other stuff, and my UPS crashed (see other blog), and I forgot about it for a bit in the hectic process of recovering from that. When I woke up this morning, I woke with an idea. The diskette drive I've been using is a 1.2 mb drive, and that read/writes 80 tracks of 15 sectors per track. But the 360 kb drives I wrote the disks with, used 40 tracks of 9 sectors per track. And because there's twice as many tracks, the tracks are narrower, and so is the read/write head. So maybe, I thought, if only I still had a 360 kb drive, it would read them? Because the read-write head is better matched to the tracks on the floppy. This is actually something I've known for, well, 25 years. When you're in data recovery, it helps to know things like that. So I went out to the shed, where I keep old computer bits, and rooted around, and I found Dobbin! Dobbin was a computer we used as an old workhorse. It had a full length 10 megabit ethernet card, which I picked up in a job lot really cheap and was the basis for my first ethernet network. It had a full length video card, which would be able to do monochrome text and nothing else, and a full length hard disk controller card, connected to a 10 megabyte hard drive. Yes. 10 megabytes. These days, you put 1000 megabytes of memory in a computer, and hard drives are a million megabytes. And it had two floppy drives. I knew they'd be 360kb, because that's all that was possible in that ancient a computer. So I pulled out the drives. They were ... manky. 25 years of sitting idle had left them filthy, greasy and horrible. So I cleaned them up with a bit of alcohol, and installed one of them in the linux box. And it was just what the doctor ordered (the disk doctor, that is). I was able to read all the floppies very nicely, and put the files onto my network. And I also found the box with the missing diskettes numbered 20 to 27. So now I'm going to go through all that data, and de-duplicate (I see some files are there multiple times). Then I'll weed out the useless stuff (there's some Dos programs there, not really of interest). And I'm thinking I might make a Kindle book out of it all. What's there? There's the fiction stories I wrote, and the technical articles for the magazines, some correspondence and some product reviews. And on one disk, I found a version of Findvirus that was able to find 15 viruses! and file viruses 405, 648, 1168, 1701, 1704, 1813, 2086 and 3066." The algorithm was absolutely awful; this was before I did the Big Rewrite that made it go like the clappers. At about 11:30 pm last night, I had a meltdown. The immediate cause was that one of my UPSes decided to suddenly conk out. That brought down all the servers that it was feeding. And for some reason, the lack of access brought down the workstation that I mostly use. So I went down to the garage, and immediately saw that a bank of servers was off, plus the ethernet switch. I messed around with the UPS for a few minutes, but soon decided to abandon it, look at it later. I brought in another UPS, a much smaller one (I usually have a couple of spares), and started to power that up. Then I thought, maybe it's not a good idea to put all the servers onto the smaller UPS, so I rearranged the power cables, and put the servers that I'm loading up for taking to Cheltenham on power without a UPS (it's less important if they get a power glitch, and even a plus, because it'll test their resilience to power-off and power-on). All the servers powered up just fine, I'm glad to say. But on one of them ... I'd combined the two 2tb drives together into a 4tb raid, which you can do under Fedora 16 (you couldn't do that until recently), and I'd called the resulting monster /dev/md0. But when I tried to revive /dev/md0, it wouldn't. It kept telling me "already in use". I tried googling, but that didn't help, and I tried various mdadm commands istead of -assemble, including -build and -create, but nothing worked. Eventually, I decided that this version of mdadm, or maybe just using 4tb, is too flaky, and I'll do this using two separate 2tb drives. So I tried to make a file system on one of the drives. And it told me "already in use". By this time, it was about 1am, and I was getting tired, but I pressed on. I had a look in /dev, to see if there was a /dev/md0 (there wasn't) and I noticed that there was a /dev/md127. Hmmm. I wonder what that is? So I fscked it, and mounted it, and it was the raid that I'd created and called /dev/md0. I have no idea why Fedora decided to change the name. Also - when I tried to reboot my workstation, which had just totally frozen, the reboot got stuck as it was loading up the haldaemon. The answer to that turned out to be patience - after a while, the boot completed. Again, I don't know why. On the UPS issue - I'm fed up with UPSes that are too heavy to handle, 50 kg or so. In future, I'm going for lighter ones, 25 kg or so, even though that means they have less stored power. The reason is, I get two kinds of power cut. One is a quick blink, wihch would reboot the computers, but which any UPS can handle, and the other is a multi-hour blackout caused by a major grid problem, which takes hours, and which no UPS would handle. I just got a phone call from the Halifax; they've been investigating my complaint about spam, and they tracked it back via Freedom Marketing to Azam Marketing, and they're now trying to find out how my email address got onto the list in the first place. And then James Appleton, the very nice man I've been talking to there, really surprised me - they're going to send me a cheque for £50 in compensation for my time and trouble. Well, I wasn't expecting that, and certainly haven't been asking for compensation, but I'm not going to refuse! ffion crashed - that's the computer that I use for pqs from Groundspeak. So I popped down to the garage to reboot it. I couldn't see it. I looked at my database of where each computer is - rack 2, shelf 2. The other four computers were there, but a big hole where ffion should have been. OK, we do this the hard way. I looked at the label on each computer, thinking I must have moved it and forgotten. No joy. So I put the flourescent lights on, and tried again. Still no luck. Then I had a think - computers don't just disappear, where could I have put it? Then I remembered - the computer that controls the Night Mail railway failed last time we had a power cut, and I decided to make ffion do that job in addition to what it was already doing. That means I moved it to the top room. Bingo! So I've rebooted it, and changed my database to reflect the move. I knew that computers don't just vanish! On of the 2 terabyte drives that I just bought, was claiming that it only had 1 tb. I was thinking about sending it back (hassle for me and for Bluepoint) and then I thought, let's run the Seagate Dos Tools on it. Huh. That also reported only 1tb, but then I used the option "Make the drive show its full amount" and voila! 2tb. And one of the computers in my workroom has been making a continuous annoying beeping, a sort of nee-naw noise. Not loud, but insistent. And I just got a coomplaint from ladysolly about it, so I had to do something. First, I built a replacement, because this is an elderly box (it's Pentium 933 MhZ, about 12 years old) and with a box that old, if you power it down, you can never be sure that it will power up. So I moved all the things it was doing onto the new machine I'd made, and powered it off. I took off the case, and it was immediately obvious what the problem was - the cpu fan looked dark brown, and sure enough, it wouldn't spin. So the cpu wasn't getting the cooling it needed, and the nee-naw was alerting me to that. Actually, I'm surprised that it continued to function. So a quick fan replacement, and it's back in action. But the new computer is making a high pitched whining noise ... it's very high pitched, and I'm hoping that ladysolly can't hear it, I know she can't hear the mosquito-scarer that I can (just) hear. That was what the email from Nancy A. Christenson offered. And I've always wanted to have lunch on a lawyer, although obviously I'd want a clean tablecloth between my lunch and the legal body, so I replied, "Yes please, am I in time to be included?" According to her email, I opted in to her email list. Actually, I'm certain that I didn't, because it came on an email that I only ever used once - as the email that shows up in the whois database, so it was clearly harvested from there. She replied "Unfortunately, since our last email all the spots on February 15 have filled up. I'm hoping the 22nd will work for your schedule. There is a spot reserved for you on that date, but please let me know at your earliest convenience." So I emailed back saying that the 22nd would be fine, and I asked her about the venue. I'm hoping that it isn't in Oregon, USA, where they appear to be based - after all, why would she have emailed me if she wasn't organising this lunch in the UK? Oh, and I forgot to ask who would be paying for this lunch - I'll ask her next time. I've been assuming that they'll be paying, but I shouldn't make assumptions. Oh, and I'll have to ask if she'll pay my travel expenses - if the lunch turns out to be in Oregon where they're based, that could be a bit expensive. Fedora 16, and they changed everything. Well, not everything, but a fair bit. I hate it when they do that, I have to learn a whole new set of stuff, and then it's relevant for some versions, and the old way is relevant for others. For example, SELinux (Security Enhanced Linux). That's to stop users messing with each other's stuff. Like so many security systems, it brings with it many pains in the arse, and since I only have one user on each server (me) I don't need it, so I disable it when I install Linux. With versions 6 to 12, and probably others, you did that from the GUI, you just started the SELinux controller, clicked on Disable and that's done. With 16, you can't. You edit /etc/selinux/config and set it to disable. Maybe there's another way, but the point is, it's *different*. Also. There used to be /etc/init.d/rc3.d and under that, there would be a bunch of services like S60nfs (which told the system to start up the NFS server on power-up). And there was a user interface that made it easy to disable some services that I didn't want, and enable others. So, they changed that. So, how did I know it was /etc/init.d/rc3.d? Well, I just did, from years of use. And now it's all different. Ugh. And how do you start up a service? It used to be "/etc/init.d/nfs start" and now it's "systemctl start nfs-server.service". I don't mind changes when it makes things better, but when something that used to work no longer works, for no good reason, that's annoying. I mean, they could have made "/etc/init.d/nfs start" translate to "systemctl start nfs-server.service" without me having to do anything, but they didn't. Although /etc/init.d/httpd start still works. Logic? We've heard of it. And I also found that although Fedora 16 would install nicely on my Foxcomm motherboards, it won't install on my Gygabyte motherboards (although Fedora 15 will). I try to boot from a CD, and it refuses to boot from the CD. I have no idea why. Computers are like that, and I wasted ages trying to fault-find before I worked that out. One system I did today; when I powered it up, nothing happened. Not a surprise, it was like that when I took it down. I didn't know why it was dead, but now I do - the PSU is knackered. With a replacement PSU (and I also changed the memory sticks, the old ones were duff also) it started up fine. It turns out that PSU failure is the second commonest hardware problem I get (the commonest is hard drive failure, the third is memory stick failure). And the power supply tester I just bought for a few pounds came in handy here, letting me verify that the old one is dead, and checking that the replacement is up to snuff. Still the snow outside, plus it's very cold. So building more boxes today. Plus I phoned yourdataplanet.com to complain about the spam they sent me, on 08454 679179. I must say, the guy I spoke to there was quite short with me. "Get a life" was his comment. Still, in mitigation, he did say that he was very busy. Ladysolly's malaise has improved a bit - she's sitting up and playing with her iPad, a good sign. And Lifesure called me back, they're investigating how come they sent me a spam. 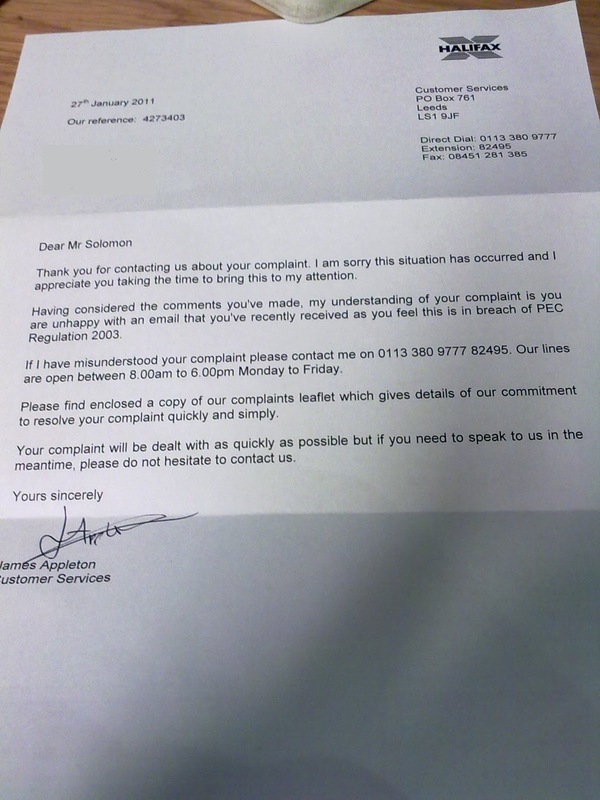 Plus another letter from the Halifax, this time enclosing their "How to complain" leaflet. Interestingly, the Financial Services Agency gives them eight weeks to resolve a complaint, and their leaflet also tells me how to contact the Financial Ombudsman, on 0845 080 1800, which might be useful some time. For a while now, something behind me has been going "Ching-chang" occasionally. I've been gradually eliminating what isn't doing it, but I suddenly got inspired as to what it is. Worked out how to use it as an ssh terminal, so I can access my servers when I'm in the middle of a muddy field. Worked out how to use it as a Wifi hotspot, so I can use a decent computer when I'm in the middle of a muddy field. And a few other things that look like they ought to be useful, but which I've never actually used. One of the things I set up, is an email account that automatically forwards to the phone, if anything it sent to that address. And what's happening, is that occasionally something I do, or something someone else does, triggers an email to that address, and the phone is telling me "New email". I'm glad I've sussed that, it's been bothering me. The new drives arrived today, well done Bluepoint, delivery next day! So I've started to build the new computers. Four out of six built so far, and with the snow on the ground outside, caching looks less attractive anyway, so I can make good use of the snowbound time. Operating systems loaded up (Fedora version 16), software loaded, and now putting the backed-up data files in place. There's no big urgency here; the customer facing computers are looking fine, and each of them has a working backup - what I'm building here, is the second backups. Having two backup systems makes everything more relaxed, and for a very small cost - a 4 terabyte computer costs about £250 or so. Meanwhile, I got a spam from a company "Christian broadband". It's how to write a love letter. To be precise, the company is Etico, but a bit of sniffing around reveals a small group of companies all with Tim Longton as director, one of which is "Christian broadband". On their web page, they say that their service is ideal if "You don't want to be bombarded with or tempted by unhelpful internet content." I just love the "unhelpful", it's almost as vague as "inappropriate". Anyway - their spam is unhelpful. So I phoned Tim up, and I have to say that his attitude was quite Christian - he denied breaking the law, said "It's only a regulation", wasn't at all polite to me, and seemed to think that it was perfectly OK for him to send me spam on how to write a love letter because he'd bought the spamming list in good faith. Well, faith can spam mountains, I've heard. And he said he'd call me back with the name of the organisation that sold him the database, but that hasn't happened yet. Offering me half of the $10.5 million left by Arthur Solomon, who was involved in an accident and died intestate in China. The letter is long and complicated and gives much detail, and ... unusually ... came through the post. So it cost someone actual money to post it! Unlike the dead Nigerian princes I usually get by email. Poor old Arthur. I always told him not to go skiiing along the Great Wall, but would he listen? He would not. The lack of snow there would not have deterred him, he was always an adventurous type. Last year he went underwater hang-gliding, and the year before that he went bee-hunting in Romania. Mr Hung Pang, who wrote to me, says that I do not need to have known dear old Arthur, and asks me not to betray his confidence, so I won't. He's already been a bit busy, and from the kick-off in 2000, made an additional $1.5 million in the first month alone - by now, if he kept up that rate of return, I calculate that the fund must be £500,000,000,000,000. That's 500 trillion dollars. Almost enough to pay off the UK National Debt (only kidding, the National Debt is only one trillion pounds). So I'm not going to fall for this scam. Offering me a mere $5m out of his $500 trillion pot! I'll wait until he ups the offer. In other news, ladysolly has a tummy upset. Maybe the fish she ate at the restaurant last night, I thought it looked horrible. A filling, lower right molar. A little bit of drilling, a howl of pain, a local anasthetic and a numb jaw. More drilling, a bit of poking, a tidge of polyfiller and it's done. Not too bad. But it's never an enjoyable experience. The anasthetic should wear off in a couple of hours. For the dead servers, I've ordered 11 2tb drives (I don't think there's any point in getting smaller, and the bigger ones aren't good value for money). But 2tbs used to be £41 and now they're £79, that must be the problem that hit Thailand. Oh well, needs must. So then I downloaded Fedora 16, the latest, and now I'm installing it. The 11 new drives will probably arrive tomorrow, and since the snow is still thick on the ground, I'll spend the day installing them. One of my servers at Cheltenham was acting the goat - lots of errors being reported on drive sda, which is, of course, the boot drive. So I decided to apply the well-known power-off-power-on cure. It works often enough to be worth trying. So I went to my remote power controller ... and couldn't access it. Ugh. So I phoned up Cheltenham, got an immediate answer, and was told, "Oh yes, we changed all the IP addresses for the power controllers." "Hey!" I replied, "How come you forgot to tell me?" Duh. So they power cycled the server for me, and told me the new address of the power controller, and when I logged into it, I noticed that all the servers were powered up, which A) isn't how I leave it, and B) costs someone electricity, and that's a real cost, I pay £17 per amp per month. They swore that changing the IP address couldn't have caused that, and they think what happened was, some helpful sysadmin noticed that most of the servers were powered off, and helpfully powered them on. Oh well. Not a big deal, especially as they've agreed not to charge me for the power (and anyhow, we're tallking quite a small amount of money). But it's the principle of the thing, I really don't like third parties messing with my servers without my say-so. So, I was up till 2am on Saturday sorting all this out. Back to the server that was acting umpty - the drive really is hopping on one leg, as we say in the trade, and will need to be replaced. The other five drives on that box seem OK, so I'll build a server with a new drive, take it down there, and plug the other five into the new box. While messing with the other servers, I found another one has completely given up the ghost, and I already had four that were needing to be replaced, so it's worth making a trip down there for a big swap-out; six out and six in. And then, Sunday morning ... one of my servers here started misbehaving. Also traced to a dead drive. So I swapped that out, and restarted the machine ... at which point, another dead drive revealed itself. So another swap-out, and now it looks OK, except that I have to reload those two new drives from backups. Come Monday, I'll be calling up Bluepoint and giving them the good news. I need 11 new 2-terabyte drives, that'll be about £1000. And a new DVD drive, because the one in my Windows XP tower is on the blink. Yes, I do run Windows XP - I have two geocaching applications that need Windows. So I said to Her Indoors, I said, "Let's stay indoors". The wireless was saying "Is your journey really necessary?" so we decided to cancel her birthday celebration at the Grove. Son-in-law offered to pick us up in his Discovery, so we went after all, and as it happened, the roads were really clear of snow. So we had a pig-out at the buffet there; I had smoked salmon and casserole of Bambi. Yum. The women were all rabbiting about "spa treatments". These are totally unnecessary pseudo-medical processes that, apparently, make women feel good while costing about one full-spec IPad each. Me - I get a frequent mud bath for free, plus occasional rain treatments. Snow. :-( looks like no geocaching until further notice. Gertcha. 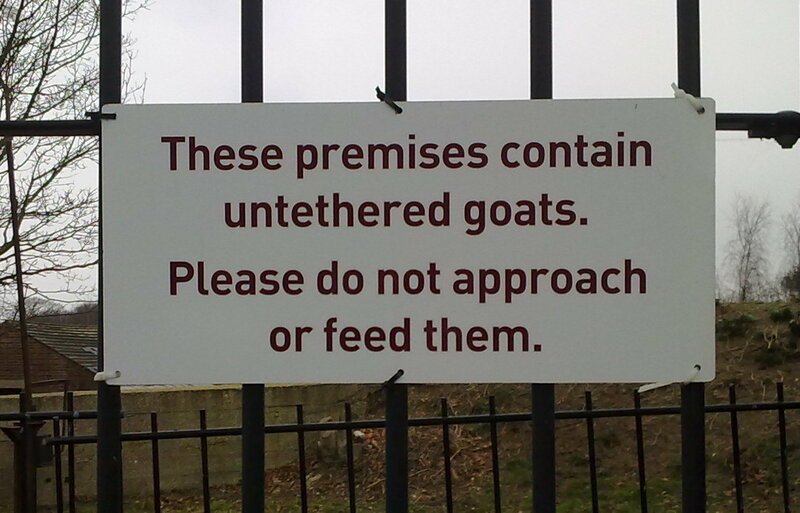 But I didn't see any goats. After a couple of dozen caches, it started to snow, and the radio said to expect six inches, so I decided to scuttle for home. Another spam that arrived: "Subject: What would a "Ph.D" title do for your resume?" Answer - nothing whatsoever; I doubt if two PhDs would impress people any more than the one I already have. Bank (A well reputable financial institution with its Branches all over the world. I'd be a fool to turn this down, it's the biggest amount I've seen in an emailed offer. Fortunately, I'm a fool. So, today I got a call from British Pound Savers. "Do you want to save money?" Undaunted, he continued. He wanted to know who our gas supplier was, and electricity, and then if I'd be willing to take a call from somoene who could offer a better deal. "No." Still undaunted, he wanted to know if I'd had ... various things that have been in the news for being mis-sold, and which therefore maybe I could be persuaded to join a lawsuit. "No." After several more refusals like this, he asked my age. So then he wanted to know what age bracket I was in, and he offered me a few options. "I'm not telling you." And at that point, I think the penny finally dropped. "Are you on the Telephone Preference Service?" "Yes, I am. What's your name?" "Frosty." And your second name? "Owen" And your phone number? "01273 956091" I happen to know that's a Brighton exchange, so I thought I'd push him further. And your address? "Richmond House, Richmond Road, Brighton." So he's maybe telling the truth. So I explained to him. "Frosty, it's against the law to make a sales call to someone who is on the Telephone Preference Service. Did you know that?" Yes, he did, but he gets given a list of numbers to call and he just calls them. "Can I speak to your supervisor?" "OK"
So then I spoke to Kevin Dindayal. "Kevin, it's against the law to make a sales call to someone who is on the Telephone Preference Service. Did you know that?" Yes, he did. But he gets given a list ... "Kevin, can I speak to your manager?" because I want to talk to someone who isn't just given a list. "They're all in a meeting." How inconvenient. "Then could your manager call me back as soon as he's out of the meeting? And what's his name?" Fortunately, the meeting ended at just that moment, and I was able to talk to his manager. That got me to Mike Lee. "Mike it's against the law to make a sales call to someone who is on the Telephone Preference Service. Did you know that?" Yes, he did. "But we'll take you off the list, you won't be called again." 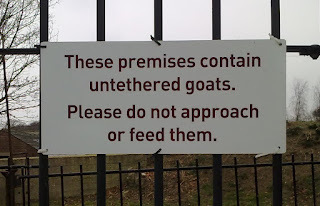 I imagine they'd be quite keen to do that. "No, that isn't what I want." "What do you want?" "I want you to start complying with the law by checking your numbers against the TPS before you call them." He wasn't too keen on that. "That's done by our IT Department. In Mauritius." "Nevertheless, if they don't do it, you must, in order to comply with the law." "You might be surprised by this, but many of the people who we call who are on the TPS are very pleased to get our calls." You're right, I am. I mean, what sort of idiot would take the trouble to put themselves on the TPS, and still be pleased to get sales calls? "Mike, even if they are glad to get your calls, it is still against the law for you to call them. Will you start checking against the TPS?" Eventually, he said that he would. But I don't see how he's going to do that, since I don't think he has a copy of it. And clearly, neither do the folks in Mauritius. And I tidied the situation up by making a formal complaint against British Pound Savers on the TPS web site. And then I did a bit more digging; British Pound Savers seems to be a division of Yesmediauk, and they're related in some way to "Satallite and home care service Ltd" (based in Bognor Regis), and found the name and phone number of the boss; Paul Elliott, and I called him on 07852 338658 (thank you http://whois.domaintools.com/britishpoundsavers.com) and repeated my complaint to him. He said he'd check out where they got the phone number from, and remove it from their list. So. If you don't want to be called by Frosty and his ilk, sign up with the TPS. And if you're called anyway, get their details and make a complaint.